Unless you’re going to Istanbul and plan on negotiating to buy a carpet at the Grand Baazar, you probably don’t think of negotiation as part your travel plans. While many of us realize we can negotiate abroad, most of us assume we’re stuck paying whatever price the Orbitz website spits back out at us. This tip comes from a hotel reservation agent who feels guilty about lying when customers ask for the lowest rate she says to ask for the “very” lowest rate. They should ask for the very lowest rate. Not just the lowest rate — the very lowest rate. Another tip is to contact hotels that are independently owned. They are more likely to give you a deal or a discount than a national chain would. Hotels can offer a “walk-out” or “walk-away” rate if they feel like they may lose a customer on price alone. The walk-out price is the lowest price the hotel will let the room go for in order to prevent the customer from — you guessed it — walking out. I’ve even heard of some bold customers ask directly, “What’s your walk-away price?” Keep in mind, it’s harder to negotiate rates during busy nights, peak travel holidays, or early in the day before the hotel can gauge its bookings. All you have to do is ask if they have any free upgrades available. At worst they will snigger and say no. Oops — nothing except possibly a little blush on your cheeks to show for it. At best: you will be relaxing in your king sized hot tub in your full suite upgrade…for free. If you are checking in (especially later in the day), the hotel already has an idea of how many suites are booked. Larger suites are usually pre-booked in advance, so if the room is available, they may well upgrade you. It shows well for the hotel (hey — if you got a free upgrade, you'd be talking the hotel up too! ), and it doesn't reflect any additional cost to them. Car rental companies are notorious for fleecing consumers with unset rates — but that also makes them easier to negotiate with. Just like negotiating for hotel rates, it’s best to check Kayak or a similar source to get a baseline fee of the best available rates. For the best weekend deal call up on Friday sometime before 2pm and say, "I have all my info, drivers license and credit card, can I get a rental all setup so I don't have to do anything but sign the ticket when I come in?" If you come in with a Ford Focus reservation and were interested in a larger car, I’ll charge an upgrade for you to get into a Ford Escape. If you have a Ford Escape reservation and are looking for something more fuel-efficient, I’ll charge you an upgrade to a Ford Focus. This actually happens! The “fee” is entirely at the salesperson’s discretion, and is entirely negotiable. Or others tell us that they have a limited number of free upgrades to give away. The secret: car rental agencies have a certain number of free upgrades available to give to customers…who ask. They won't advertise this little secret (because everybody will ask — duh! ), but trust me — it works. If you know you're returning the car late, SFgate tells us to talk to the manager to waive or lower the fee. I recently learned that you can’t negotiate a break on extending your car rental by calling the main company’s switchboard — even the supervisors there were unwilling to lower the rental rate extension. But by calling the local airport dealer, where I rented directly from, the manager there could give me a better rate. Unfortunately you can’t completely negotiate your airfare (with the exception of Hotwire and Priceline, which is almost-negotiation — tips below). But there are a few tips for negotiating aspects of your airfare. Don't phone it in. It is a lot harder to look a concerned parent in the face and say no than it is to say the same words to a phone caller. Obviously this isn't always possible, but when you can, an in person visit is more likely to pay off. Explain the problem in terms that the airline can identify with. Instead of focusing on how worried we felt about flying with a sick child my husband focused on things that would cause the airline pain (or potential liability) too... phrases like "I'm concerned about what might happen if he becomes sicker in the air" and "Without knowing why he is throwing up, I'm worried about what germs I might be exposing other passengers to" cause more concern for the airline than "I think the best thing for him is to get some rest" or "I can't believe you don't care about a sick child." My experience has been that the only ways to get upgraded to first class is 1) when the airline has made a big mistake (e.g. overbooked your flight) or 2) you qualify through your status with the airline. But there are still plenty of tips out there for trying to negotiate an upgrade. This is only one way to get a $1 ticket with Megabus. You have to book your trip on the same day that the bus is leaving, and take the chance that a ticket is left. It's not applicable for all trips. If the bus leaves at 6 AM, and you go on after midnight to get a ticket, you may get it for $1. But you're also risking the bus being sold out, which oftentimes it is on at least one branch of the trip. An article on MSN Money says that rates go up as more people buy. My experience has also been that the farther you book in advance the more likely you are to get a cheap seat. Taxis can be a tourist trap in some parts of the world. Make sure you know the ground rules for traveling in taxis for the area you're visiting. 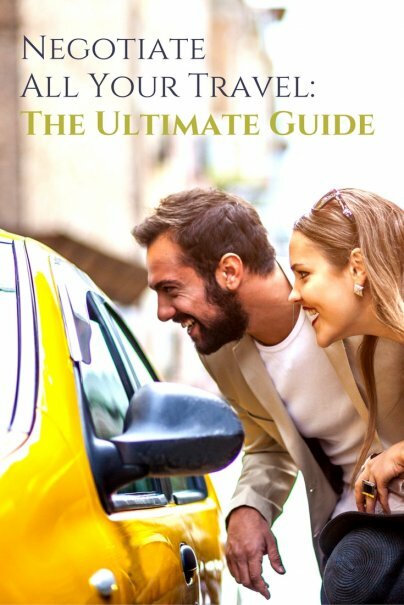 Guidebooks may be able to tell you local customs about negotiating for local transportation. For example, in Russia, people looking to make a few extra dollars drive around in their personal cars and act as taxis. (There are also official taxi companies but they charge outrageous prices.) When I studied abroad in St. Petersberg I would negotiate the price down by about 80% less than what I would have paid a taxi. Most guidebooks will tell you if this is the custom in the country or city you're visiting. Whenever I arrive in a new destination, before even stepping out of my hotel, guesthouse or hostel for the first time, or even the airport if I’m arriving by plane, I always make sure to ask a reliable local how the taxi system works. Such reliable people include the staff in the guesthouse, the official information booth at the airport or any other local who has no interest in leading me astray. [I]f you know roughly what the journey should cost, then it’s better to pay at the end. Be sure to err on the side of generosity, and make sure you have the correct change. The driver certainly won’t give you any of his. By the time your driver realizes that he has lost the opportunity to scam you, you’ll be long gone. Get more tips from these great resources. Ramit Sethi, at I Will Teach You to Be Rich has a compilation of posts about how to negotiate. Here’s a great article from the Guardian about learning to negotiate. So, there are ways to negotiate travel. You just have to know your goals, what price-point you’re aiming for, and a few tricks of the trade. And of course, if you happen to ever be at the Grand Bazaar in Istanbul, I highly recommend negotiating the carpet dealers down by about 50%. You’ll get a fantastic piece at an amazing price. Just don’t make the mistake I did by being too cheap to ship it back home. Make sure to compare prices and use them against each other if possible. Last year my wife and I did an overnight trip to a touristy area a few hours away from home. It was slightly off season so we were able to call a few hotels while in the car, get their rates, then call back and start using the lower rates to drive the other prices down. We ended up finding a pretty good place, got a fully loaded suite, and at a great rate. I absolute DISAGREE with - "[I]f you know roughly what the journey should cost, then it’s better to pay at the end. Be sure to err on the side of generosity, and make sure you have the correct change. The driver certainly won’t give you any of his. By the time your driver realizes that he has lost the opportunity to scam you, you’ll be long gone." The key word is "KNOW". Many people THINK the KNOW the correct amount when they do not. This could end up being very unfair to the taxi driver. You can do this and then you find out your were wrong the price should have been much more. You have now stiffed the driver! Now what do you do? Those are extremely helpful tips - thanks! Esp. that there are no upgrade fees on rental cars? There's a no-brainer!